The Realm of Midgard is a fantasy / medieval RPG setting, that I intend to expand indefinitely. It has ruins, cities and villages and castles - explore for yourself! It also has its own lore and several guilds & factions. I began work on Midgard with "Seven Hills", a medieval / fantasy themed city. It's a massive city. Since then, I've added the cities of "al'Atreide" (a desert city), "Port Bloodsand" (the squalid "city of thieves") along with several smaller settlements and villages. 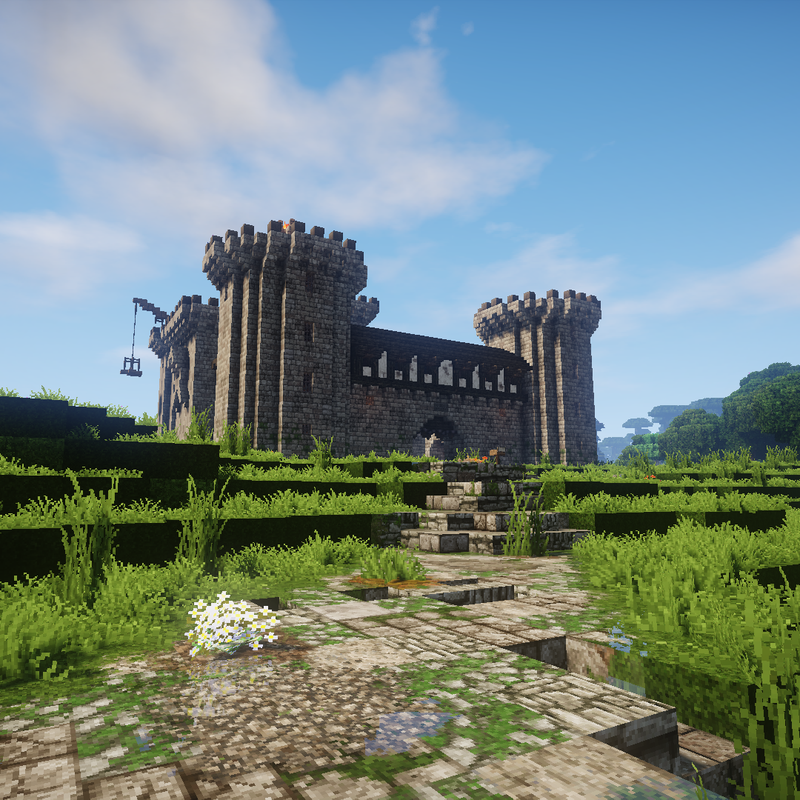 I'm currently working on the elven city of "Don-Golin". The realm of Midgard is an ideal setting for an RPG game. If there any YouTubers interested, I'd appreciate video reviews, as it's a great source of feedback. I strongly recommend using medieval style resource packs such as "Conquest" or "John Smith Legacy" as the build style is best experienced in these (though obviously that's at your own discretion!). Feel free to download and explore my world. However, do not distribute this build or claim it as your own. I hope you enjoy my little project, please leave any feedback / suggestions. Excuse me, can I authorize the transfer to the MCBBS website? I will indicate the original post and the original post download address. I don't actually know what the MCBBS website is? I'm sorry, but please don't post / re-host / transfer my build ("The Realm of Midgard") to any third-party website, as I wish to keep it exclusively on Curse.com. Feel free to post a link to it here if you like! Hi, it's the command "gamerule doFireTick false". Hope you enjoy, if you do, please leave feedback! How do you install? Put in mod folders or what? Looks awsome tho! Hi, it's a save file - all you need do is unzip it, and place it in your saves folder! Hope you enjoy! Thanks for the reply! I checked the world out and I Loooooovvvveeeee It! I like editing houses and make them my own, I really like that most of the houses are decorated. Also fun to turn on FireTickSpeed Haha! Glad you liked it! If you find any undecorated house, let me know, I think that they're all done but may have missed one or two! hey Druss! I just realized I hadn't posted here yet. Wanted to give you some feedback and say that your map is awesome! We've been using it on my server for several months now. In the Seven Hills city, I did have to remove some of the houses to make it more navigable for players, but I tried to leave it mostly untouched. Also, we've tried to populate the city with CustomNPCs based on the shop signs you put up. Love it! In reply to Rutes: Hi Rutes - we've actually chatted before (you asked my permission to use the map for your mod, "Less Tech, More Dragons"). Delighted you're enjoying the map, I know you mentioned that you had been using an older version - I was wondering if you'd a chance to look at the current map (Seven Hills is complete, a I've built new desert city with very different style that has a shared history with Seven Hills, a few new villages, castles and ruins to explore and find). Would love to see your server someday. I did download your mod, but couldn't get it to work (and was worried I'd mess it and my current set-up up). Thanks agin for the feedback! oh yes, I remember :D I just meant I hadn't given feedback in comments on here yet - only in direct messages. Yes, please! We would love it if you could join us. If you have the Twitch Launcher, you should be able to install the modpack by searching "Less Tech More Dragon" in the "modpacks" section. Also, you could use the TechnicLauncher if you'd rather do that. Same thing there, just search "Less Tech More Dragon" and it should show up. Oh yes, I love the updates! The desert city is great, and I really like the roads and paths leading out into the wilderness and connecting the different places. I actually have been keeping the map current (and preserved) in a separate world-space on the server. Then I copy and paste sections into the main world using WorldEdit in-game. Hereʻs a tip for anyone checking out this awesome map! Using NBTExplorer will allow you to turn off FireTick BEFORE you get on the map. That way itʻs off and you donʻt have to worry about not typing the cheat command fast enough. Fire wonʻt even have a chance to spread. Thanks for the tip - and the "awesome" compliment! How do you find my map? Are there any particular places that you like? I've been hoping for feedback from someone, so would really appreciate your thoughts. I spend a ton of time searching for pre-built maps to do roleplaying on and I decided to see what CurseForge had to offer. What I like the most about your map is how everything is built into the generated map and how it casually goes with the biome you put it into. I also like how you used this to create different towns with different themes instead of everything being "oak and stone" medieval. I favor sandstone/desert places but I also enjoy the "swamp" styles. Youʻve put in effort to have your map be medieval but also add different types/cultures so that your RPG world is diverse and expansive. I really like having the option of having factions that are of entirely different worlds. Thank you for the feedback! I'm always open to suggestions for any way to improve! This mod looks awesome,but I think I'm doing something wrong. I downloaded the file and put it in my mods folder but when I started the game nothing popped up. Are you suppose to spawn near the town or do you have to find it? Hi, this is a Minecraft save, not a mod. Download the zipped file, and put it in your Minecraft saves folder. When you open the game, it sould appear in the saved games. Then explore and (hopefully) enjoy! Please let me know what you think! I downloaded it and put it in my saves folder but it's not appearing in my saved games.